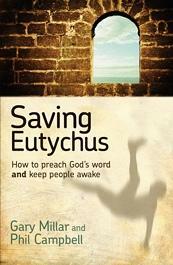 The Aussie and Irishman team of Campbell and Miller write Saving Eutychus to save your congregation from the fate of Eutychus, the man known for his near-fatal napping during one of St. Paul’s sermons. They write from a Reformed perspective—the book’s early chapters emphasizing the importance of expository preaching (“the message of the text is the message of the sermon”), prayer, preaching Christ, and heart change. Every pastor has preached a groaner, or worse yet, a yawner. How can we avoid boring our people to death? The authors think the answer is clarity, especially in content, delivery, and critique. Chapter three addresses sermon preparation and offers ten tips for making the substance understandable. Chapter six is a very brief chapter on the oratorical aspects of preaching and chapter seven promotes peer review of sermons. The final chapter and appendix are samples. Their self-depreciating (“my mush-bowl brain”) and informal style (“Give me a break—that’s not a sentence!”) is helpful in many ways, as it makes the reading enjoyable and the critique easier to swallow knowing it comes from pastors who do not think they have arrived. By the end of the book, however, it becomes a bit distracting. The topic is one in which every preacher wants to improve. Their “Top Ten” lists on structure and delivery are practical and insightful. I implemented several elements immediately. Chapter five (“Why Preaching the Gospel is So Hard”) didn’t seem to fit the flow of the book. The hermeneutics of preaching Christ from the Old Testament is helpful, but it seemed forced. The final chapter (“Let’s Build a Sermon”) was disappointing. We look over Campbell’s shoulder as he prepares and preaches next Sunday’s sermon on Acts 8… the whole chapter… in a hair over 20 minutes. If Spurgeon recommended 40 minutes, does that mean in 50 years time we’ll be down to eleven? As a lecturer in rural Africa, I’ve got to think our pastoral students would be more discouraged than encouraged after reading that among the ways to keep people awake are PowerPoint, a video clip, and preaching through a 40-verse narrative in 23 minutes. Brief. Self-effacing. Expositional. Practical. Perhaps the best compliment you can give a book on homiletics is that it makes you want to preach. Saving Eutychus does this. Read it, but shield your eyes from the last chapter, or save your money and read classics like Preaching and Preachers or Lectures to My Students. This entry was posted in Book Reviews by Paul Schlehlein. Bookmark the permalink.